The Divine Providence is the government of the Lord’s Divine Love and Divine Wisdom (n. 1-26). 1. The universe, with each thing and all things therein, was created from Divine love by means of Divine wisdom (n. 3). 2. Divine love and Divine wisdom go forth from the Lord as a one.. (n. 4). A one is impossible apart from a form, the form itself making the one. (n. 4). The form makes a one the more perfectly as the things entering into the form are distinctly different and yet united (n. 4). 3. In a certain image this one is in every created thing (n. 5). 4. The end of the Divine Providence is that every created thing, in general and in particular, shall be such a one; and if it is not, that it shall become such (n. 7). 5. Good of love is good only so far as it has become joined with truth of wisdom; and truth of wisdom is truth only so far as it has become joined with good of love (n. 10). 6. Good of love that has not become joined with truth of wisdom is not good in itself, but is apparent good; and truth of wisdom that has not become joined with good of love is not truth in itself, but is apparent truth. (n. 14). 7. The Lord does not suffer any thing to be divided; consequently it must be in good and also in truth, or it must be in evil and also in falsity (n. 16). 8. That which is in good and also in truth is something; but that which is in evil and also in falsity is not any thing (n. 19). 9. The Lord's Divine Providence causes both the evil and the falsity to be serviceable in the way of equilibrium, of relation, and of purification, and thus in the conjunction of good and truth in others (n. 21). The Lord's Divine Providence has as its end a heaven from the human race (n. 27-45). 1. Heaven is conjunction with the Lord (n. 28). 2. From creation man has an ability to be more and more nearly conjoined with the Lord (n. 32). How man is more and more nearly conjoined with the Lord (n. 33). How that conjunction appears more and more near (n. 33). 3. The more nearly a man is conjoined with the Lord the wiser he becomes (n. 34). 4. The more nearly a man is conjoined with the Lord the happier he becomes (n. 37). 5. The more nearly a man is conjoined with the Lord the more distinctly does he seem to himself to be his own, and the more clearly does he recognize that he is the Lord's (n. 42). The Lord's Divine Providence looks in every thing that it does to what is infinite and eternal (n. 46-69). 1. The Infinite in itself and the Eternal in itself is the same as the Divine. (n. 48). 2. The Infinite and Eternal in itself must needs look to what is infinite and eternal from itself in things finite (n. 52). 3. The Divine Providence, in all that it does, looks to what is infinite and eternal from itself, especially in saving the human race (n. 55). An image of the Infinite and Eternal in the variety of all things (n. 56). An image of the Infinite and Eternal in the fructification and multiplication of all things. (n. 56). 4. An image of the Infinite and Eternal is presented in an angelic heaven. (n. 60). 5. Looking to what is infinite and eternal in the formation of the angelic heaven, that it may be before the Lord as one man which is an image of Himself, is the inmost of the Divine Providence. (n. 64). There are laws of Divine Providence that are unknown to men (n. 70). It is a law of the Divine Providence that man should act from freedom in accordance with reason (n. 71-99). 1. Man possesses reason and freedom, or rationality and liberty; and these two faculties are in man from the Lord (n. 73). 2. Whatever a man does from freedom, whether it be of reason or not, provided it is in accordance with his reason, appears to him to be his (n. 74). 3. Whatever a man does from freedom in accordance with his thought is appropriated to him as his, and remains (n. 78). 4. It is by means of these two faculties that man is reformed and regenerated by the Lord; and without them he cannot be reformed and regenerated. (n 82). Man's first state, which is a state of damnation (n. 83). Man's second state, which is the state of reformation (n. 83). Man's third state, which is a state of regeneration (n. 83). 5. By means of these two faculties man can be so far reformed and regenerated as he can be led by means of them to acknowledge that every thing good and true that he thinks and does is from the Lord, and not from himself (n. 87). 6. By means of these two faculties the conjunction of the Lord with man and the reciprocal conjunction of man with the Lord are effected (n. 92). 7. The Lord preserves these two faculties in man inviolate and as sacred in the whole course of His Divine Providence (n. 96). Without these two faculties man would not possess will and understanding, and would not be man (n. 96). Without these two faculties man could not be conjoined with the Lord, and thus could not be reformed and regenerated (n. 96). Without these two faculties man could not have immortality and eternal life (n. 96). 8. Therefore it is [a law] of the Divine Providence that man should act from freedom in accordance with reason (n. 97). It is a law of the Divine Providence that man should as if from himself put away evils as sins in the external man; and the lord is able in this way and in no other to put away evils in the internal man, and simultaneously in the external (n. 100-128). 1. Every man has an external and an internal of thought (n. 103). 2. The external of man's thought is in itself of the same character as its internal (n.106). 3. The internal cannot be cleansed from the lusts of evil so long as the evils in the external man are not put away, since these obstruct (n. 111). 4. The evils in the external man can be put away by the Lord only through man's instrumentality (n.114). 5. Therefore man ought as if of himself to put away evils from the external man (n. 118). 7. It is the unceasing effort of the Lord's Divine Providence to conjoin man with Himself and Himself with man, that He may be able to bestow upon man the happinesses of eternal life; and this can be done only so far as evils with their lusts are put away (n. 123). The Lord in no wise acts upon any particular thing in man singly without acting simultaneously upon all things of man (n. 124). The Lord acts from inmosts and from outmosts simultaneously (n. 124). It is a law of the Divine Providence that man should not be compelled by external means to think and will, and thus to believe and love, the things of religion, but should guide himself, and sometimes compel himself (n. 129-153). 1. No one is reformed by miracles and signs, because they compel (n. 130). 2. No one is reformed by visions or by conversations with the dead, because they compel (n. 134). 3. No one is reformed by threats and punishments, because they compel (n. 136). The external cannot compel the internal, but the internal can compel the external (n. 136). The internal is so averse to compulsion by the external that it turns itself away (n. 136). External enjoyments allure the internal to consent, and also to love (n. 136). A compelled internal and a free internal are possible (n. 136). 4. No one is reformed in states that do not spring from rationality and liberty (n. 138). In a state of fear (n. 139). In a state of misfortune (n. 140). In a state of blindness of the understanding (n. 144). 5. To compel oneself is not contrary to rationality and liberty (n. 145). 6. The external man must be reformed by means of the internal, and not the reverse (n. 150). It is a law of the Divine Providence that man should be led and taught by the Lord from heaven by means of the Word and by means of doctrine and preachings from the Word, and this to all appearance as if by himself (n. 154-174). 1. Man is led and taught by the Lord alone (n. 155). There is an only essence, an only substance, and an only form, from which have come all the essences, substances, and forms that have been created (n. 157). That only essence, substance, and form is the Divine love and the Divine wisdom, from which are all things that have relation to love and wisdom in man (n. 157). It is likewise the Good itself and the Truth itself to which all things have relation (n. 157). These are the life, which is the source of the life of all things and of all things of life (n. 157). This Only and Itself is omnipresent, omniscient, and omnipotent (n. 157). This Only and Itself is the Lord from eternity, or Jehovah (n. 157). 2. Man is led and taught by the. Lord alone through the angelic heaven and from it (n. 162). 3. Man is led by the Lord by means of influx, and taught by means of enlightenment (n. 165). 4. Man is taught by the Lord by means of the Word, and by means of doctrine and preaching from the Word, and thus immediately by the Lord alone (n. 171). The Lord is the Word because the Word is from Him and treats of Him (n. 172). The Lord is the Word because it is the Divine truth of the Divine good (n. 172). Thus to be taught from the Word is to be taught by the Lord Himself (n. 172[5D). That this is done mediately through preaching does not take away the immediateness (n. 172). 5. In externals man is led and taught by the Lord in all appearance as if by himself (n. 174). It is a law of the Divine Providence that nothing of the operation of the Divine Providence should be evident to man's perceptions or senses, but that he should, nevertheless, know about it and acknowledge it (n. 175-190). 1. If the operation of the Divine Providence were made evident to man's perceptions and senses he would not act from freedom in accordance with reason; nor would any thing appear to him to be his. It would be the same if he foreknew events (n. 176). 2. If man clearly saw the Divine Providence he would intrude himself into the order and tenor of its course, and would pervert and destroy it (n. 180). Externals are so connected with internals as to make one in every operation (n. 180). If man should be at the same time in the internals he would pervert and destroy the whole order and tenor of the Divine Providence (n. 180). 3. If man clearly saw the Divine Providence, either he would deny God or he would make himself to be God. (n. 182). 4. It is granted man to see the Divine Providence in the back and not in the face; also to see it in a spiritual state and not in his natural state (n. 187). Man's own prudence is nothing; it merely appears to be something, and should so appear; but the Divine Providence, because of its minute particulars, is universal (n. 191-213). 1. All of man's thoughts are from the affections of his life's love; and apart from these there are and can be no thoughts whatever (n. 193). 2. The affections of a man's life's love are known to the Lord alone (n. 197). 3. By means of His Divine Providence the Lord leads the affections of a man's life's love, and at the same time leads his thoughts, from which human prudence is derived (n. 200). 4. By means of His. Divine Providence the Lord combines the affections [of the whole human race] into one form, which is the human form (n. 201). 5. Heaven and hell are in such a form (n. 204). 6. Those that have acknowledged nature alone and human prudence alone constitute hell; while those that have acknowledged God, and His Divine Providence constitute heaven (n. 205). Whence man's prudence is and what it is (n. 206). Whence the Divine Providence is and what it is (n. 207). Who and what those of each class are (n. 208). 7. None of these things could be done except from the appearance to man that he thinks from himself and directs all things from himself (n. 210). The Divine Providence looks to eternal things, and to temporal things only so far as they agree with eternal things (n. 214-220). 1. Temporal things relate to dignities and riches, thus to honors and acquisitions in the world (n. 215). What dignities and riches are, and whence they are (n. 215). What the love of dignities and riches for their own sake is, and what the love of dignities and riches for the sake of uses is (n. 215). These two loves are distinct from each other as heaven and hell are (n. 215). The difference between these loves can scarcely be made known to man (n. 215). 2. Eternal things relate to spiritual honors and possessions which pertain to love and wisdom in heaven (n. 216). Honors and possessions are blessings and they are curses (n. 217). When dignities and possessions are blessings they are spiritual and eternal, and when they are curses they are temporal and perishable (n. 217). Dignities and possessions that are curses, compared with dignities and possessions that are blessings, are as nothing to everything, or as that which in itself is not to that which in itself is (n. 217). 3. Temporal things and eternal things are separated by man, but are conjoined by the Lord (n. 218). What temporal things are and what eternal things are (n. 219). Man is in himself temporal, and the Lord is in Himself eternal; and therefore only what is temporal can proceed from man, and only what is eternal from the Lord (n. 219). Temporal things separate eternal things from themselves, and eternal things conjoin temporal things to themselves (n. 219). The Lord conjoins man with Himself by means of appearances (n. 219). The Lord conjoins man with Himself by means of correspondences (n. 219). It is from the Divine Providence that by death man puts off what is natural and temporal, and puts on what is spiritual and eternal (n. 220). Through His Divine Providence the Lord conjoins Himself with natural things by means of spiritual things, and with temporal things by means of eternal things, according to uses (n. 220). The Lord conjoins Himself with uses by means of correspondences, and thus by means of appearances in accordance with the confirmations of these by man (n. 220). This conjunction of temporal and eternal things is the Divine Providence (n. 220). Man is admitted interiorly into truths of faith and into goods of charity only so far as he can be kept in them until the end of his life (n. 221-233). 1. A man may be admitted into the wisdom of spiritual things, and also into a love for them, and yet not be reformed (n. 222). 2. If a man afterwards recedes from these spiritual things and passes over into the opposite he profanes holy things (226). Whatever a man thinks, says, and does from his will, whether good or evil, is appropriated to him, and remains (n. 227). But the Lord by means of His Divine Providence continually foresees and arranges, in order that evil may be by itself and good by itself, and thus the two may be separated (n. 227). But this cannot be done if man acknowledges the truths of faith and lives according to them, and afterwards withdraws from and denies them (n. 227). Man then mixes together good and evil to such an extent that they cannot be separated (n. 227). Since good and evil must be separated in every human being, and cannot be separated in such a one, he is therefore destroyed in respect to everything truly human (n. 227). 3. There are many kinds of profanation of what is holy, but this is the worst kind of all (n. 229). The first kind of profanation is committed by those who make jests from the Word and about the Word, or from the Divine things of the church and about them (n. 231). The second kind of profanation is committed by those who understand and acknowledge Divine truths, and still live contrary to them (n. 231). The third kind of profanation is committed by those who adapt the sense of the letter of the Word to the confirmation of evil loves and false principles (n 231). The fourth kind of profanation is committed by those who say with the lips pious and holy things, and counterfeit the affections of love for these in tone and in gesture, and yet in heart do not believe and love them (n. 231). The fifth kind of profanation is committed by those who attribute to themselves what is Divine (n. 231). The sixth kind of profanation is committed by those who acknowledge the Word and yet deny the Divinity of the Lord (n. 231). The seventh kind of profanation is committed by those who first acknowledge Divine truths and live according to them, but afterwards recede and deny them (n. 231). 4. Therefore the Lord admits man interiorly into the truths of wisdom and at the same time into the goods of love only so far as he can be kept in them even to the end of his life (n. 232). Good and evil cannot be in man's interiors together, neither, therefore, the falsity of evil and the truth of good together (n. 233). Good and the truth of good can be brought into a man's interiors by the Lord only so far as evil and the falsity of evil there have been removed (n. 233). If good with its truth were to be brought in before or to a greater extent than evil with its falsity is removed, man would recede from good and return to his evil (n. 233). When man is in evil many truths may be brought into his understanding, and these may be stored up in the memory, and yet not be profaned (n. 233). But the Lord by His Divine Providence takes the greatest care that the will shall receive from the understanding only so fast as, and to the extent that, man as if of himself removes evils in the external man (n. 233). If it should, receive faster or more, the will would adulterate good and the understanding would falsify truth by mixing them with evils and with falsities therefrom (n. 233). Therefore the Lord admits man interiorly into the truths of wisdom and into the goods of love only so far as he can be kept in them to the end of his life (n. 233). Some things enumerated that belong to permission, and yet are in accord with the laws of Divine Providence, by which a merely natural man confirms himself in favor of nature against God, and in favor of human prudence against Divine Providence (see n. 236-240). First, Some things from the Word (see n. 236). 1. The wisest of mankind, Adam and his wife, suffered themselves to be seduced by a serpent, and God did not avert this by His Divine Providence (n. 241). 2. Their first son Cain killed his brother Abel, and God did not withhold him at the time by speaking with him, but only after the deed, by cursing him (n 242). 3. The Israelitish nation worshiped a golden calf in the wil¬derness and acknowledged it as the God who led them out of the land of Egypt; and yet Jehovah saw this from Mount Sinai near by, and did not seek to prevent it (n. 243). 4. David numbered the people, and in consequence a plague was sent upon them, by which so many thousands of men perished; and God, not before but after the deed, sent Gad the prophet to David, and denounced punishment upon him (n. 244). 5. Solomon was permitted to establish idolatrous worship (n. 245). 6. Many kings after Solomon were permitted to profane the temple and the holy things of the church (n. 246). 7. That nation was permitted to crucify the Lord (n. 247). Second, Some things seen in the world (see n. 237). 2. The worshiper of himself and of nature confirms himself against the Divine Providence when he sees the impious exalted to honors and to high offices in church and state, also abounding in wealth and living in luxury and magnificence, while he sees the worshipers of God despised and poor (n. 250). 3. The worshiper of himself and of nature confirms himself against Divine Providence when he reflects that wars are permitted, and the consequent slaughter of so many men, and the plundering of their wealth (n. 251). 4. The worshiper of himself and of nature confirms himself against Divine Providence when he reflects according to his perception that victories are on the side of prudence, and sometimes not on the side of justice; and that it makes no difference whether the commander is an up¬right man or not (n. 252). Third, Things relating to the religious conditions of various people (see n. 238). 1. The merely natural man confirms himself against the Divine Providence when he considers the religious condition of various peoples—that there are some who are totally ignorant of God, and some who worship the sun and moon, and some who worship idols and graven images (n. 254). 2. The merely natural man confirms himself against the Divine providence when he sees the Mohammedan religion accepted by so many empires and kingdoms (n. 255). 3. The merely natural man confirms himself against the Divine providence when he sees that the Christian religion is accepted only in the smaller division of the habitable globe called Europe, and is there divided (n. 256). 4. The merely natural man confirms himself against the Divine providence by the fact that in many of the kingdoms where the Christian religion is accepted there are some who claim for themselves Divine power, and wish to be worshiped as gods, and that the dead are invoked (n. 257). 5. The merely natural man confirms himself against the Divine providence by the fact that among those who profess the Christian religion there are some who place salvation in certain phrases which they should think and talk about, making no account of the good works they should do (n. 258). 6. The merely natural man confirms himself against the Divine providence by the fact that there have been and still are so many heresies in the Christian world, such as Quakerism, Moravianism, Anabaptism, and others (n. 259). 7. The merely natural man confirms himself against the Di¬vine providence by the fact that Judaism still continues (n. 260). Fourth, Things relating to Christian doctrine. (see n. 239). 1. A doubt may arise in opposition to the Divine providence from the fact that the whole Christian world worships one God under three persons, which is to worship three Gods, not knowing hitherto that God is one in person and essence, in whom is a trinity, and that the Lord is that God (n. 262). 2. A doubt may arise in opposition to Divine providence from the fact that hitherto men have not known that there is a spiritual sense in all the particulars of the Word, and that its holiness is therefrom (n. 264). The spiritual sense of the Word has not been revealed before, because if it had been the church would have profaned it, and thereby have profaned the essential holiness of the Word (n. 264). The genuine truths in which the spiritual sense of the Word resides were not revealed by the Lord until the last judgment had been accomplished, and the new church that is meant by "the Holy Jerusalem" was about to be established by the Lord (n. 264). 3. A doubt may arise in opposition to Divine Providence from the fact that hitherto men have not known that to shun evils as sins is the Christian religion itself (n. 265). 4. A doubt may arise in opposition to Divine Providence from the fact that it has not hitherto been known that man lives as a man after death; also that this has not been disclosed before (n. 274). Evils are permitted for the sake of the end, which is salvation (n. 275-284). 1. Every man is in evil, and must be led away from evil in order to be reformed (n. 277a). 2. Evils cannot be removed unless they appear (n. 278a). Of those who confess themselves guilty of all sins, and do not search out any one sin in themselves (n. 278b). Of those who neglect the search from religious reasons (n. 278b). Of those who for worldly reasons think nothing about sins and are therefore ignorant of them (n. 278b). Of those that favor sins, and in consequence cannot know them (n. 278b). To all such sins are not apparent, and therefore cannot be removed (n 278b). The reason hitherto hidden why evils cannot be removed unless they are sought out, discovered, acknowledged, confessed, and resisted (n. 278b). 3. So far as evils are removed they are remitted (n. 279). It is an error of the age to believe that evils have been separated, and even cast out, when they have been remitted (n. 279). It is an error of the age to believe that the state of man's life can be changed instantly, and thus from being evil man can become good, and in consequence can be led out of hell and transferred straightway into heaven, and this by the Lord's mercy apart from means (n. 279). Those who so believe know nothing whatever about what evil is or what good is (n. 279). Those who believe in instant salvation and mercy apart from means do not know that affections, which belong to the will, are nothing but changes of the state of the purely organic substances of the mind; and that thoughts, which belong to the understanding, are nothing but changes and variations in the form of the substances; and that memory is the state of these changes and variations that remains permanent (n. 279). 4. Thus the permission of evil is for the sake of the end, that there may be salvation . (n. 281). 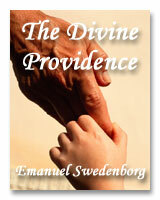 The Divine Providence is equally with the evil and with the good (n. 285-307). 1. The Divine Providence, not only with the good but with the evil as well, is universal in every least particular; and yet it is not in their evils (n. 287). They could not then be blamed for doing evil (n. 294[2J). This makes evil to seem to be from the Lord (n. 294). They do not comprehend how the Lord alone can cause all to think so diversely (n 294). 2. The evil are continually leading themselves into evils, but the Lord is continually leading them away from evils (n. 295). In every evil there are things innumerable (n. 296). An evil man from himself continually leads himself more deeply into his evils (n. 296). The Divine Providence with the evil is a continual permission of evil, to the end that there may be a continual withdrawal from it (n. 296). The withdrawal from evil is effected by the Lord in a thousand ways, and even in most secret ways (n. 296). 3. The evil cannot be wholly led by the Lord away from evil and into good so long as they believe their own intelligence to be everything and the Divine Providence nothing (n. 297). One's own intelligence, when the will is in evil, sees nothing but falsity, and has no desire or ability to see anything else (n. 298).If one's own intelligence then sees truth it either turns itself away or it falsifies the truth (n. 298). The Divine Providence continually causes man to see truth, and also gives an affection for perceiving it and receiving it (n. 298). By this means man is withdrawn from evil, not by himself but by the Lord (n. 298). 4. The Lord governs hell by opposites; and He governs in hell the evil who are in the world in respect to their interiors, but not in respect to their exteriors (n. 299). That the Lord governs hell by means of opposites (n. 307). The evil who are in the world the Lord governs in hell (n. 307). The Lord in this way governs the evil in the world in respect to their interiors, but otherwise in respect to their exteriors (n. 307). The Divine Providence appropriates neither evil nor good to any one; but man's own prudence appropriates both (n. 308-321). 1. What one's own prudence is, and what prudence not one's own is (n. 310). 2. Man from his own prudence persuades himself and corroborates in himself that all good and truth are from himself and in himself; likewise all evil and falsity (n. 312). 3. Every thing that a man has adopted by persuasion and confirmation remains in him as his own (n. 317). There is nothing that cannot be confirmed, and falsity is confirmed more readily than the truth (n. 318). When falsity has been confirmed the truth is not seen, but from confirmed truth falsity is seen (n. 318). An ability to confirm whatever one pleases is not intelligence, but only ingenuity, which may exist even in the worst of men (n. 318). There is confirmation that is intellectual and not at the same time voluntary; but all voluntary confirmation is also intellectual (n. 318). The confirmation of evil that is voluntary and also intellectual causes man to believe that his own prudence is everything and the Divine Providence nothing; but this is not true of intellectual confirmation alone (n. 318). Every thing confirmed by the will and also by the understanding remains to eternity, but not what has been confirmed by the understanding only (n. 318). 4. If man believed, as is the truth, that all good and truth are from the Lord and all evil and falsity from hell, he would not appropriate good to himself and make it meritorious, nor appropriate evil to himself and make himself guilty of it (n. 320). To one who confirms in himself the appearance that wisdom and prudence are from man and are in man as his, it must needs seem that otherwise he would not be a man, but a beast or a statue; and yet the contrary is the truth (n. 321). To believe and think, as is the truth, that every good and truth is from the Lord and every evil and falsity from hell appears like an impossibility; and yet it is the truly human principle, and therefore the angelic (n. 321). To believe and think thus is impossible to those who do not acknowledge the Divinity of the Lord and who do not acknowledge that evils are sins; but it is possible to those who do acknowledge these two things (n. 321). Those that are in these two acknowledgments, so far as they shun and turn away from evils as sins, need only to reflect upon the evils in themselves, and to cast them away to the hell from whence they are (n. 321). Thus the Divine providence does not appropriate evil to any one nor good to any one, but his own prudence appropriates both (n. 321). Every man may be reformed, and there is no such thing as predestination (n. 322-330). 1. The end of creation is a heaven from the human race (n. 323). Every man was created to live forever (n. 324). Every man was created to live to eternity in a state of blessedness (n. 324). Thus every man was created to come into heaven (n. 324). The Divine love must needs will this, and the Divine wisdom must needs provide for it (n. 324). 2. Therefore it is of the Divine providence that every man can be saved, and that those are saved who acknowledge God and live well (n. 325). The acknowledgment of God causes a conjunction of God with man and of man with God; and the denial of God causes severance (n. 326). Every one acknowledges God and is conjoined with Him according to his good of life (n. 326). Good of life, or living rightly, is shunning evils because they are against religion, thus against God (n. 326). These are the general principles of all religions, whereby every one can be saved (n. 326). 3. Man himself is to blame if he is not saved (n. 327). In process of time every religion declines and is consummated (n. 328). Every religion declines and is consummated by the inversion of God's image in man (n. 328). This comes from the continual increase of hereditary evil from generation to generation (n. 328). Nevertheless the Lord provides that every one may be saved (n. 328). It is provided also that a new church should follow the previous devastated church (n. 328). 4. Thus all men were predestined to heaven, and no one to hell (n. 329). Any predestination except to heaven is contrary to the Divine love, which is infinite . . (n. 330). Any predestination except to heaven is contrary to the Divine wisdom, which is infinite . . (n. 330). That only those born within the church are saved is an insane heresy (n 330). That any of the human race are damned by predestination is a cruel heresy (n. 330). The Lord cannot act contrary to the laws of the Divine Providence, because acting contrary to them would be acting contrary to His Divine love and contrary to his Divine wisdom, thus contrary to himself (n. 331-340). 1. The operation of the Divine Providence for the salvation of man begins at his birth and continues until the end of his life and afterwards to eternity (n. 332). 2. The operation of the Divine Providence goes on unceasingly, through means, out of pure mercy (n. 335)3. Instantaneous salvation from mercy apart from means is impossible (n. 338). The belief in instantaneous salvation out of mercy apart from means has been adopted from the natural state of man (n. 338). This belief comes from an ignorance of the spiritual state, which is wholly different from the natural state (n. 338). The doctrines of the churches in the Christian world, viewed interiorly, are opposed to instantaneous salvation out of mercy apart from means; but it is upheld, nevertheless, by the external men of the church (n. 338). 4. Instantaneous salvation out of mercy apart from means is the "fiery flying serpent" in the church (n. 340). Religion is abolished thereby (n. 340). A belief in instantaneous salvation out of pure mercy alone induces security of life (n. 340). By that belief damnation is attributed to the Lord (n. 340).